Deep inside the Inner Gorge of Grand Canyon, northern Arizona, are the crystalline basement rocks that probably date back even to the Creation Week itself. Clearly visible in the canyon walls are the light-colored granites, such as the Zoroaster Granite, which are stark against the darker, folded strata of the Vishnu Schist and the other metamorphic rock units of the Granite Gorge Metamorphic Suite1 (see lowest purple and green shading in diagram). These are former sedimentary and volcanic strata that have been transformed by heat and pressure, possibly during the intense upheavals when the dry land was formed on Day 3 of Creation Week.2 Among these metamorphosed volcanic strata are amphibolites, belonging to the Brahma Schist. These were originally basalt lava flows several meters to tens of meters thick. In some outcrops pillow structures have been preserved, testimony to the basalt lavas having originally erupted and flowed under water onto the Creation Week ocean floor. Twenty-seven Brahma amphibolite samples were collected from various Inner Gorge outcrops as part of the RATE (Radioisotopes and the Age of The Earth) project. These included seven samples from a 150 meter long and 2 meter wide amphibolite body outcropping just upstream from the mouth of Clear Creek at river mile 84 (measured from Lees Ferry). All 27 samples were sent to two well-credentialed internationally-recognized, commercial laboratories for radioisotope analyses—potassium-argon (K-Ar) at a Canadian laboratory, and rubidium-strontium (Rb-Sr), samarium-neodymium (Sm-Nd), and lead-lead (Pb-Pb), at an Australian laboratory. Both laboratories use standard, best-practice procedures on state-of-the-art equipment. The model K-Ar ages for each of the samples ranged from 405.1±10 Ma to 2574.2±73 Ma. Furthermore, the seven samples from the small amphibolite unit near Clear Creek, which should all be the same age because they belong to the same metamorphosed basalt lava flow, yielded K-Ar model ages ranging from 1060.4±28 Ma to 2574.2±73 Ma. This includes two samples only 0.84 meters apart that yielded K-Ar model ages of 1205.3±31 and 2574.2±73 Ma. The computer program Isoplot6 was used to plot isochrons and calculate isochron ages from the other radioisotope analyses. The best isochron plots, where all the variation from the line of best fit to the data incorporates all the analytical errors, yielded an Rb-Sr isochron age of 1240±84 Ma, an Sm-Nd isochron age of 1655±40 Ma, and a Pb-Pb isochron age of 1883±53 Ma. Most people believe that when the different radioisotope dating methods are used on the same rock unit they all yield the same age. However, the radioisotope dating of these Grand Canyon rocks clearly demonstrates that the disagreement, or isochron discordance, is pronounced. 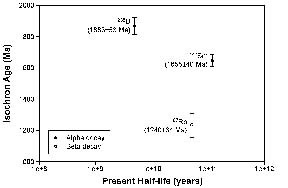 Even when the calculated error margins are taken into account the different radioisotope dating methods yield completely different "ages" that cannot be reconciled—1240±84 Ma (Rb-Sr), 1655±40 Ma (Sm-Nd), and 1883±53 Ma (Pb-Pb) (see diagram). None of the obtained isochron "ages" corresponds to the "date" for any recognized event, neither the original lava eruptions nor the subsequent metamorphism. And the K-Ar model "ages" are so widely divergent from one another (ranging from 405.1±10 Ma to 2574.2±73 Ma), even from very closely spaced samples from the same outcrop of the same original lava flow, as to be useless for "dating" any event. These discordant results could easily be dismissed as an isolated aberration, perhaps due to the uncertain effects of metamorphism and any subsequent alteration, especially during erosion and weathering. 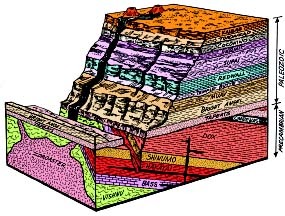 However, they are confirmation of the repeated failure of all the radioisotope "dating" methods to successfully date Grand Canyon rocks.7,8 Furthermore, papers in the general geological literature are also reporting discordant radioisotope "dates" when all the methods are applied to the same rock unit,9 but tenuous "explanations" are given to account for the anomalous amounts of daughter products, and avoid the inescapable conclusion that the radioisotope methods simply do not yield reliable absolute ages. Yet the RATE research has uncovered much evidence, including the patterns of these discordances between the "dates" from the different radioisotope systems,10 that radioisotope decay rates were accelerated in a global catastrophic event in the recent past.11 For example, if accelerated radioisotope decay occurred, then alpha-decaying radioisotopes would yield older isochron "ages" than beta-decaying radioisotopes, which is exactly the pattern in the Brahma amphibolites (see diagram above). Because the different radioisotopes are dating the same geologic event, to have produced different "dates" has to mean that the parent radioisotopes have decayed at different rates over the same time period. In other words, the decay of the parent radioisotopes was accelerated by different amounts, the decay of those yielding older "ages" (the alpha-decayers) having been accelerated more. Obviously, if radioisotope decay was accelerated, say during the Genesis Flood, then the radioisotope decay "clocks" could never be relied upon to "date" rocks as many millions of years old. To the contrary, the rocks could still only be a few thousand years old. The radioisotope methods, long touted as irrefutably dating the earth's rocks as countless millions of years old, have repeatedly failed to provide reliable and meaningful absolute ages for Grand Canyon rock layers. Irreconcilable disagreement within and between the methods is the norm, even at the outcrop scale. This is a devastating "blow" to the long ages that are foundational to uniformitarian geology and evolutionary biology. Yet the discordance patterns are consistent with past accelerated radioisotope decay, which would also render these "clocks" useless. Thus there is no reliable evidence to dispute that these metamorphosed basalt lava flows deep in Grand Canyon date back to the Creation Week only thousands of years ago. Karlstrom, K.E., B.R. Ilg, M.L. Williams, D.P. Hawkins, S.A. Bowring, and S.J. Seaman, 2003, "Paleoproterozoic rocks of the Granite Gorges," in, S.S. Beus, and M. Morales, eds., Grand Canyon Geology, second edition, New York, Oxford University Press, pp. 9-38. Austin, S.A., ed., 1994, Grand Canyon: Monument to Catastrophe, Santee, California, Institute for Creation Research, chapter 4, pp. 57-82. Hawkins, D.P., and S.A. Bowring, 1999, "U-Pb monazite, xenotime, and titanite geochronological constraints on the prograde to post-peak metamorphic thermal history of Paleoproterozoic migmatites from Grand Canyon, Arizona," Contributions to Mineralogy and Petrology, vol. 134, pp. 150-169. Hawkins, D.P., S.A. Bowring, B.R. Ilg, K.E. Karlstrom, and M.L. Williams, 1996, "U-Pb geochronologic constraints on the Paleoproterozoic crustal evolution of the Upper Granite Gorge, Grand Canyon, Arizona," Geological Society of America Bulletin, vol. 108, pp. 1167-1181. Ilg, B.R., K.E. Karlstrom, D.P. Hawkins, and M.L. Williams, 1996, "Tectonic evolution of Paleoproterozoic rocks of Grand Canyon: Insights into middle-crustal processes," Geological Society of America Bulletin, vol. 108, pp. 1149-1166. Ludwig, K.R., 2001, Isoplot/Ex (Version 2.49): The Geochronological Toolkit for Excel, University of California Berkeley, Berkeley Geochronology Center, Special Publication No. 1a. Austin, S.A., and Snelling, A.A., 1998, "Discordant potassium-argon model and isochron 'ages' for Cardenas Basalt (Middle Proterozoic) and associated diabase of eastern Grand Canyon, Arizona," in, R.E. Walsh, ed., Proceedings of the Fourth International Conference on Creationism: Pittsburgh, Pennsylvania, Creation Science Fellowship, pp. 35-51. Snelling, A.A., Austin, S.A., and Hoesch, W.A., 2003, "Radioisotopes in the diabase sill (Upper Precambrian) at Bass Rapids, Grand Canyon, Arizona: An application and test of the isochron dating method," in, R.L. Ivey, Jr., ed., Proceedings of the Fifth International Conference on Creationism: Pittsburgh, Pennsylvania, Creation Science Fellowship, pp. 269-284. Musaka, S.B., Wilson, A.H., and Carlson, R.W., 1998, "A multielement geochronologic study of the Great Dyke, Zimbabwe: Significance of the robust and reset ages," Earth and Planetary Science Letters, vol. 164, pp. 353-369. Snelling et al., op. cit. Vardiman, L., Snelling, A.A., and Chaffin, E.F., eds., 2005, Radioisotopes and the Age of The Earth: Results of a Young-Earth Creationist Research Initiative, Santee, California, Institute for Creation Research, and St. Joseph, Missouri, Creation Research Society, in preparation. * At time of publication, Andrew A. Snelling, Ph.D. geology, was Associate Professor in the Geology Department at ICR Graduate School. Cite this article: Snelling, A. 2004. Radioisotope Dating of Grand Canyon Rocks: Another Devastating Failure for Long-Age Geology. Acts & Facts. 33 (10).